View Cart "Thomas Joseph Placemats" was successfully added to your cart. Sold individually, you can decide how many you need to suit the family size. 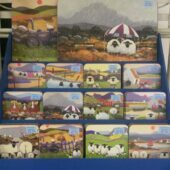 The whimsical world of Thomas Joseph coasters sets are a beautiful and humorous take on the Irish countryside and the sheep that are so commonly found here. The images applied are a good example of some of the designs. 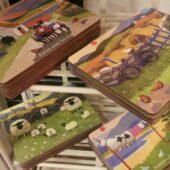 The whimsical world of Thomas Joseph placemats sets are a beautiful and humorous take on the Irish countryside and the sheep that are so commonly found here.